Remember the stamp from yesterday? I told you I love it! I used it again on this card which is a very simple one. I did not have paper the same color as my Washi tape, so I performed a bit of magic. I adhered a few strips of the solid Washi tape to some thin white paper. Then I die cut the Eiffel Tower. That way the color was perfect! 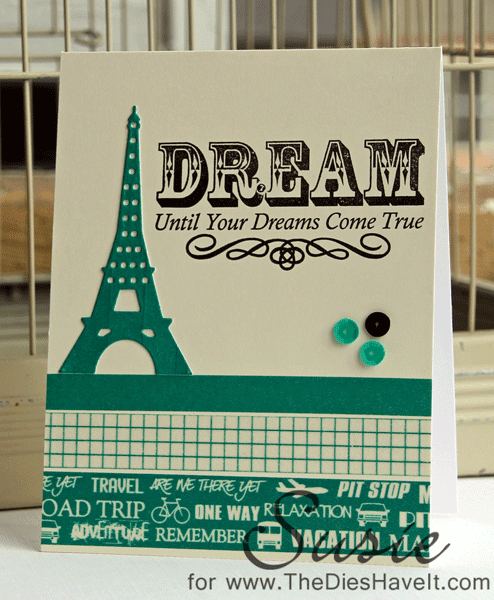 The stamp and die are both available from MFT Stamps. You know them by now! They are MY favorite stamp company!